The landscape is increasingly perceived as a resource. For this reason, it is necessary to find legal, political and economic instruments that will succeed in managing this "resource landscape" in the long term. The Swiss government recently introduced the instrument of regional nature parks into the legislation governing nature and landscape preservation; the proposed parks are organized on the basis of the French model. The examination of the new parks from the perspective of much older management structures, i.e. the civic municipalities (bourgeoisies) and corporations, makes it possible to demonstrate the strengths and weaknesses of each of these instruments in their contribution to the resolution of use rivalries between actors who use or influence the resource landscape. This comparison also enables the formulation of practical recommendations regarding the management of this resource. 1Urban sprawl, the neglect of outlying regions, the demise of mountain agriculture, the extension of transport and communication networks, the management of water bodies etc. all have a direct influence on the landscape, which is increasingly perceived as threatened with impoverishment as a result of the standardization of land uses (OFEFP, 1998; Rodewald, 1999; Conseil de l’Europe, 2000; Ambroise et Hubert, 2002; Stremlow et al., 2003). 2The sense of loss triggered by this change in or disappearance of the landscape is leading to an awareness of the existence and importance of the "resource landscape" that prompts social groups who are anxious to defend "their" landscape to become politically organized. Apart from the landscape preservation and environmental protection organizations, the selfappointed champions of the landscape cause, the tourism sector is also beginning to realize its dependence on the survival of high quality landscapes. Thus, landscape is now perceived as a resource that requires long-term management (European Landscape Convention). The questions that arise against the background of this development concern the instruments that could prove suitable for the coordination of the activities of different actors for the purpose of remedying the deterioration and impoverishment of landscapes and the ways in which this complex resource, which extends beyond the limits of individual plots and municipal boundaries, could be managed. 3The revision of the Federal Law on the Protection of Nature and Cultural Heritage (Loi fédérale sur la protection de la nature et du paysage) of 1966, which introduced the instrument of regional nature parks (parcs naturels régionaux/PNRs) (art. 23g), came into force in Switzerland in July 2007. Both the economic sectors and nature conservation organizations approved by a large majority the creation of this new instrument, which is based on the model of the French nature parks: while the latter view them as an additional instrument for protecting the landscape, the former see them as a means of promoting tourism. 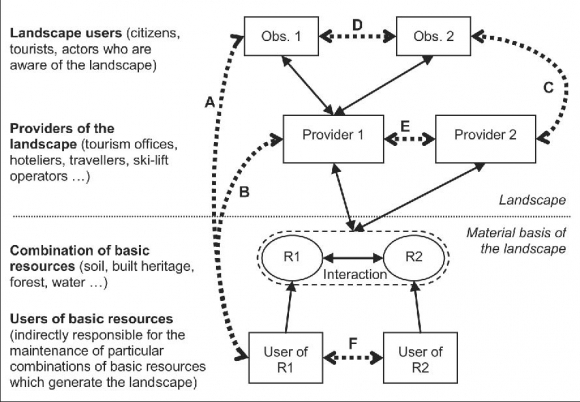 Having presented the different "users" of landscapes, in this paper we then examine the role played by a different category of actor in relation to landscape management, i.e. the civic municipalities (bourgeoisies) and other territorial corporations, about which little is known in many cases or which tend to be peremptorily dismissed as vestiges of the past. Despite the fact that they own vast expanses of forest and pasture land, the civic municipalities and corporations are actors who remain very much on the sidelines in the context of regional planning debates. Whereas, in the past, they played a central role in relation to the management of natural resources and provision of social assistance and constituted a binding force in village communities, today they are experiencing a general loss of interest. However, as we shall see, these actors still hold certain trump cards – their role as land owners being one of the more significant ones – which could result in them assuming a significant role in the context of the new regional nature parks policy which is based on the acknowledgement that the principles of sustainability can only be concretized through the achievement of a better relationship between the groups of actors responsible for the implementation of the PNRs and those holding the rights of use to the natural resources in question (see Knoepfel et al., 2001 : 37; Knoepfel et Nahrath, 2006 : 49). In the final part of this paper we shall see how the PNRs could benefit from the experience of the civic municipalities and corporations in the area of landscape management or take inspiration from this model while avoiding certain pitfalls which will also be demonstrated. 4The European Landscape Convention defines the landscape as "an area, as perceived by people" (Conseil de l’Europe, 2000). According to Berque (1990: 48), the landscape should be understood primarily as the relationship between a social group and its material environment. This relationship is the sense that a group of observer actors confer on a particular spatial configuration of basic resources (i.e. forest, soil, water, built heritage etc.) which it considers as important in relation to the references it draws on in terms of its cultural capital, shared history, the mood of the moment, the images that have become rooted in people’s minds etc. 5The resource concept obliges the analyst to examine the actors who use the resource and who develop different strategies to secure control of the services it provides. 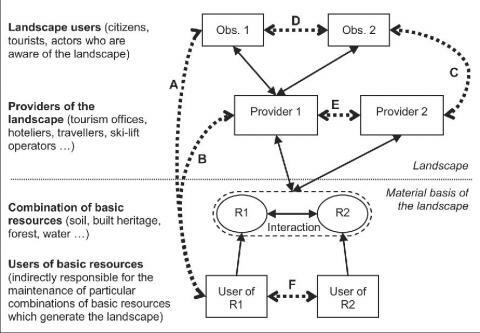 This assumption of control of the services provided by the resource is implemented in practice through the mobilization of certain property rights (to the basic constituent resources of the landscape – the landscape in itself is not subject to property rights) or certain provisions defined in the relevant public policies. In an attempt to typologize the actors who use or influence the resource landscape, it is possible to identify three categories of actors: the observers who make direct use of the services provided by the resource (e.g. leisure, spectacular views, culture), the landscape providers, who benefit economically from the resource (e.g. tourism) and the users of basic resources provided by the landscape. An actor’s membership of one or other of these categories basically implies differences in terms of their relationship with the landscape (patrimony, source of revenue, relaxation etc.) and in terms of the choice of strategies they adopt in relation to its protection and use (Figure 1). Figure 1. Typology of landscape actors based on the rights they can mobilize to secure control of the resource. The distinction proposed between observers, providers and users of basic resources does not constitute a stakeholder analysis but should be understood as a typology enabling the apprehension of reality using a suitable analytical tool and demonstration of the potential conflicts. Conflicts A and B involve the opposition between a group of observers or a provider and a user of basic resources, for example when the latter’s activities impair the material basis of the landscape. Conflict C involves the opposition between a group of observers and a provider, for example when the price demanded by the provider to enable him/her to profit from the landscape is deemed too high for the observers. Conflict D involves opposition between groups of observers themselves, for example in situations of excessive density. Conflict E arises in situations of economic competition between providers. Conflict F is more rare; it occurs when two users of basic resources compete with each other, for example, for a remunerated landscape preservation service. Certain scenarios in the diagram may remain empty in particular empirical situations (e.g. direct access of observers to the combination of landscape resources without the intermediary of a provider). An actor may also be located in more than one scenarios in the diagram (e. g. the farmer who respects a quality label and, as a result, "sells" a landscape at the same time as selling a product). 61 – The observers group brings together those actors who enjoy the landscape. These include walkers, photographers, "nature lovers" etc. They benefit directly from one or more services provided by the landscape. They either seek out the landscape that interests them themselves and benefit from the fact that the landscape is a common-pool resource1, or they avail of the services of a provider who leads them to the landscape in exchange for a payment. The observers are often resident in locations away from landscapes they appreciate. 72 – The providers are actors who have appropriated the landscape – be it through the control of access, through property rights to one of the basic resources it provides or through the droit d’auteur ("author’s right," i.e. copyright) – and who profit from their dominant position to "sell" the landscape to the observers. In principle, the providers are also concerned to maintain the landscape (to a certain extent) so as to ensure sustained income from the observers. The providers can take the form of ski lift operators, tourism offices, hoteliers, tour operators etc. The providers can be resident both within and outside of a landscape area. 2 In principle, the landscape is defined as such by another group of actors. 83 – Finally, although they do not make direct use of landscape services, the users of basic resources should be taken into account. If these users have any awareness of the existence of the landscape2, they see it at most as the outcome of a positive externality of their action on basic resources. This action falls within the realm of all activities that have a potential impact on the landscape; of these, the two main roles are played by agriculture and construction-related activities. 9The typology presented is based on the fact that the above-described actors do not secure the control of the resource using the same politico-legal instruments. The observers benefit from the freedom of movement and the right of access to pasture lands and forests (guaranteed by article 699 of the Swiss Civil Code), as well as the rights they acquire in association with the purchase of a relevant transport or entrance ticket. The providers benefit from the ownership of a strategic position (property title, franchise etc. ), from the possession of a means of controlling access to the landscape and of levying an entry charge (means of transport, restaurant etc.) or of a specific right obtained on the basis of droit d’auteur. Finally, the users of basic resources benefit in principle from their property right to these resources. 10These three categories of actors are likely to come into conflict with each other (Figure 1). In effect, the interests of the users of basic resources and of the providers are generally far better protected by the law than those of the observer group who generally only benefit from a right of access to the landscape, but not to the possibility of preventing its modification. However, it should be mentioned that Swiss procedural law awards a certain influence to the organizations that represent them through the right of appeal. However, even this right gives them less power as compared with the property rights held by the users of basic resources. Furthermore, the right of appeal in Switzerland is subject to systematic attacks in the federal parliament by the defenders of the property developers (although the Swiss Federal Supreme Court upholds at least two thirds of the appeals presented by these organizations (Flückiger et al., 2000). 11Based on the consideration of the three categories of actors who use or influence the landscape, it is legitimate to hypothesize that the sustainable management of the landscape will only be attainable if these three types of interests are truly coordinated with each other in a restrictive way, i.e. if no group of actors is able to impose its will at the expense of the others by undermining the capital of the resource. In this context, structures that unite the three categories of actors involved in a single negotiation and decision-making forum are more capable of producing solutions that could be satisfactory to all the parties involved. This type of belief implicitly underlies the current development of the PNRs in Switzerland. They must be able to play the role of a platform for debate uniting both the economic and nature protection sectors. 12The organization of the state in Switzerland is characterized by three executive levels: the municipalities, the cantons and the Confederation. According to the Federal Swiss Constitution, the organization of the municipalities is the responsibility of the cantons, thus, the analyst is faced with as many kinds of municipal organizations as there are cantons. As a result of this, the rights and obligations of the municipal authorities can be distributed between different types of municipalities which co-exist at local level. These municipal bodies can take the following forms: the political municipality (or commune des habitants ("residents’ municipality"), commune municipale ("communal municipality")), the civic municipality (commune bourgeoise), the public law corporations, the church municipalities or parishes and the educational municipalities. Innumerable variations on the combinations of these different types of municipalities exist in all of the Swiss cantons (Geser, 2002). 13A conflict – which has never been entirely resolved – exists in all democratic states between those who live in a place, those who hold property titles to lands in this place and those who hold the right to vote there. In other words, non-locals are subject to prejudice in relation to democratic participation that can never be entirely avoided. These differences in the treatment of the inhabitants of different cantons were first regulated by the Swiss Federal Constitution of 1848 and its subsequent revisions in the course of the 19th century. The new constitutional provisions constituted the force that drove the separation of the political and civic municipalities, which was rendered necessary so as to guarantee the right of all Swiss citizens to vote in the municipality in which they reside, irrespective of their canton of origin. 14Thus, the term "commune bourgeoise" or "civic municipality" refers to a municipality whose members benefit from droit de cité, i.e. the right of citizenship. As opposed to this, the political municipality unites all of those resident in its territory, irrespective of the canton or municipality to which they belong. In the same way, a parish unites all of the inhabitants of a municipality who declare themselves as members of the religious confession in question. As the civic municipality unites all of the holders of the right of municipal citizenship, its effect extends beyond the borders of the political municipality. The civic municipality is responsible for the decision to accept new citizens and this is a condition of obtaining naturalization for foreigners3. 15Apart from the granting of the right of citizenship, the traditional tasks of civic municipalities consist in securing the management of civic goods and in providing social assistance for its members in need. In the majority of cantons, the civic municipalities are no longer authorized to levy taxes thus, in many cases, the civic municipalities have also relinquished their role as the providers of public assistance. Today, their main task consists in managing their assets in a way that does not undermine the basic capital. The civic municipalities often use the proceeds gained from the management of their assets to provide sponsorship for cultural events (Moor, 1992). 16In Switzerland, it is relatively easy to distinguish the civic municipalities from the other types of municipalities; however, it is more difficult to distinguish them from the various corporations which exist in large numbers in certain cantons, in particular when they are based on public law. The prerogative of granting the right of citizenship is the main criterion that would enable the identification of a civic municipality. In cases in which this responsibility has been transferred to the political municipality, it is appropriate to refer to corporation bourgeoisiale, i.e. civic corporation, rather than bourgeoisie, i.e. civic municipality, even if the relevant cantonal legislation continues to use the term bourgeoisie in this context (Buchmann, 1997). 17Despite the significant size of the lands held by the civic municipalities and corporations, aggregated statistics are not available at national level (Buchmann, 1997). This fact is explained, in part, by the difficulty in categorizing them which is due to the diversity in their legal status, their loss of political significance and the lack of official figures in the mountain territories. However, despite these difficulties forest statistics are relatively precise: in 2003, 24.3 percent of forests belonged to the civic municipalities (i.e. 296,149 ha), 18.2 percent to the different types of corporations (i.e. 221,534 ha) and 21.4 percent to the communal municipalities (OFS, 2004). 18The civic municipalities and the corporations are forms of organizations whose legal or statutory mission is the management of a patrimony. Given that the two concepts insist specifically on a long-term perspective, the experience gained in terms of the management of this patrimony could be used to make the current reflections on "sustainable development" bear fruit (Godard, 1990; Vivien, 2001). It is in this context that the civic municipalities, the corporations and also the foundations have an important role to play. The notion of patrimony incorporates the notion of heritage but also contains references to the "fathers", i.e. ancestors, to lineage and, therefore, by association, to the heirs and descendants. Binswanger (1998) contrasts patrimonium with dominum; unlike the former, i.e. patrimony, which obliges the holder of an asset to pass it on, the latter includes the right to destroy it. Structures that have succeeded in the long-term preservation of a complex agricultural or silvicultural environment as patrimony have perfected management strategies which make it possible to cushion at local level the sometimes contradictory incentives arising from use and protection policies. It is from this perspective that the civic municipalities and corporations are being considered in this paper. 19Land ownership is the most secure legal means available to an actor to ensure the preservation of the resource landscape because, as our empirical studies have shown, recourse to policy frequently does not offer sufficient guarantees (Rodewald - Knoepfel, 2005: 111). Furthermore, land ownership also makes it possible to control the use of basic resources through the granting droits de superficie, i.e. building leases, reflecting the conditions of use defined at the time of signature of the relevant agreement guaranteeing, for example, compliance with specific landscape criteria. In addition, the ownership of the land authorizes intervention with respect to the flows of visitors who access the landscape. Even if the Swiss Civil Code guarantees access to all to the country’s forests and pastures, the ownership of land provides possibilities for action through restrictions or infrastructure aimed at the channelling of the visitor flows. As the holder of property rights to the basic resources, the civic municipalities and corporations exercise a significant influence on the use of the resource landscape. However, the ownership of land represents a relatively expensive way of controlling resources. Thus, the civic municipalities and corporations generally only hold "portions of the landscape" (limited, for example, to the resources located in a single political municipality) and can rarely aspire to the management of the entire resource landscape. 20In order to benefit from the protection provided by land ownership, the regional nature parks (PNRs) must adopt an active land policy which will enable them to purchase and exchange lands located in areas defined as strategic on the basis of landscape criteria. 21By assembling the different categories of actors who use or influence the landscape – i.e. observers, providers and users of basic resources – the civic municipalities and corporations can act as discussion forums where these actors can express their demands and agree on the courses of action to be adopted. In doing this, they can aspire to playing an important role in generating some consistency between policies which sometimes provide contradictory incentives. 22How are these different categories of actors represented within the civic municipalities and corporations? The users of basic resources are well represented. This point is central because these actors are generally not very concerned about landscapes: their actions only influence this resource indirectly (through its material basis which is constituted by these basic resources), thus they normally feel wronged when any attempt is made to restrict their scope for manoeuvre in the interest of the preservation of a resource, i.e. the landscape, which they do not use. The interests of providers are more or less represented on the basis of the tasks assumed by the civic municipality or corporation in the area of tourism (we shall return to this point later). In terms of the observers, their interests are represented in an incomplete way. Of course, the civic municipalities and corporations are not indifferent to the landscape because by their nature they are very attached to tradition and symbols. But the landscape favoured by the civic municipalities may differ from that sought by external – and often urban – observers who are more interested, for example, in landscapes which are perceived as varied. Thus, this latter category of observers is excluded from all participation and, as a result, its interests are not represented. 23If the regional nature parks would like to preserve the landscape, they must include the users of basic resources in their structure. Moreover, given that urban dwellers represent the largest group of landscape users, representatives of external observers, in particular urban observers, should also participate in the debates and discussions surrounding the resource. However, the right of participation of external actors must be accompanied by obligations and duties so as to hinder, for example, the activities of free-riders who gain economic benefits by "selling" landscapes (advertising, travel services etc.) but do not contribute to their maintenance and even impair their quality by promoting over-exploitation. A PNR could play the role of a discussion forum which, by putting people in contact with each other who would not otherwise meet, would lend a real dimension to the educational objectives the parks have defined for themselves. 24The decision-making bodies of the civic municipalities and the corporations – which consist of a general assembly and a smaller executive body – guarantee the right of participation in strategic discussions and decision-making to their members. However, from the point of view of landscape management, the decisions are not entirely democratic because, on the one hand, all of the users of the resource are not represented on these bodies and, on the other, the territory managed only covers a part of the landscape. Thus, the civic municipalities and the corporations manage the landscape as a club good which guarantees democratic participation to the members but excludes all other actors. 25The democratic legitimacy of the civic municipalities and the corporations in relation to the landscape is insufficient as a significant proportion of the resource users are excluded from its management. When transposed to the regional nature parks, this observation makes it possible to learn a key lesson: the parks are not only boundaries or areas; in order to ensure democratic decisions on the future of the resource landscape, they are above all institutional structures, generally supra-municipal, and they must behave as such, i.e. organize the "governance of the landscape." 26A characteristic of the civic municipalities and the corporations is their strong bond with the land and their long tradition of joint management of the goods in their possession. Their role as managers of municipal goods is largely established. However, this hardening of the conception of the role of the civic municipalities and corporations may also be detrimental to an evolution of their mission in the direction of the greater recognition of the landscape. An excessively strong attachment to the patrimony in their possession hinders the implementation of active land-use strategies aimed at the purchase and exchange of lands on the basis of their strategic importance for the pursuit of landscape-management objectives. 27The fact that the PNRs are ad hoc creations does not necessarily affect their legitimacy. More than tradition, their legitimacy will come from implementation acts or outputs which they will be capable of generating, in particular in terms of the sustainable management of the landscape. 28Since the second half of the 20th century, the civic municipalities and the corporations have had to deal with the structural changes that have led to the alteration of agricultural and silvicultural practices. The economic dependency of the members of such structures in relation to the jointly managed resource, whether it consists of pasture land or forest, is one of the conditions necessary to their perduration (Ostrom, 2000 : 34). There are three conceivable responses to the loss of profitability of mountain agriculture and silviculture. The first is characterized by the loss of interest on the part of corporation members resulting in the progressive dissolution of the management structure. The second would take the form of a re-conversion of these structures to the promotion of large-scale tourism to the point of the abandonment of the original long-term management objectives. The third – and most desirable – response from the perspective of the sustainable management of the landscape is that of a transfer of interest: from the promotion of the economic exploitation of basic resources, the civic municipalities and farmers associations can undertake to defend the heritage value or traditions associated with a "traditional" use of basic resources. In doing this they focus on the preservation of characteristic landscapes and, eventually, their reasonable tourism exploitation. The main priority is to establish whether the use of immaterial resources can replace the central role previously played by agriculture or silviculture as the cement that binds the group together. In view of the financial income originating from either federal incentives (direct payments) or from the development of soft tourism, there is nothing to stand in the way of the conclusion that such a transfer is possible. For their part, the parks must be able to retain a foot in both camps, i.e. to guarantee the financial balance of the operations they promote, on the one hand, and the symbolic value of the objectives they support, on the other. 29The long-term management mandate of the civic municipalities is generally enshrined in the cantonal legislation. In order to ensure its "economic sustainability", if its statutes allow it, a civic municipality assembly can decide to sell the lands that it possesses in a development zone to the highest bidder (e.g. the case of the corporation of Pfäffikon which acquired substantial financial resources by selling land located in a development zone on the shores of Lake Zurich). The legal means available for dealing with this kind of eventuality are rather weak. This is all the more true given the fact that the citizens directly concerned gave their support and the traditionally managed resources lost their economic profitability. 30The PNRs must also confront the problem of economic viability. For this reason they must permanently walk the narrow line between the economic promotion of a tourist region, on the one hand, and the unyielding protection of the landscape, on the other. However, according to the new article 23j of the Swiss Federal Law on the Protection of Nature and Cultural Heritage, the institution of the parks has a mechanism which protects them from of a situation in which the management of the environment would only be the alibi of tourism promotion: the parks must renew their label periodically so as to be able to continue to benefit from their designation as such. The renewal of the "park" label is dependent on the quality of the results obtained. This instrument must never be transformed into a complacent procedure, without which the mission of the parks in terms of landscape management would be at serious risk. 31The sustainability of the landscape rests on the – coercive and long-term – coordination of the practices of the actors on site, be they observers, providers or users of basic resources so as to avoid a potentially irreparable harm to the landscape. The sustainability of the landscape depends, therefore, on the capacity to establish the coherent governance of the resource. To this end, Switzerland has introduced the instrument of regional nature parks (PNR) into its legislation. Rather than starting with a blank slate, it is important for the parks to take into account the experience gained down through the centuries by the civic municipalities and corporations in relation to the integrated management of the rural territory. Just as the parks can learn from the civic municipalities and corporations, the latter can make the best of the new landscape management policies by reorganizing themselves around this new resource landscape as they have the advantage of controlling it at close range through the land ownership of the basic resources. We would like to thank the Swiss National Science Foundation for the support granted to this project (award number: 1255-066329). BINSWANGER H.C., 1998. – "Dominium und Patrimonium. Eigentumsrechte und pflichten unter dem Aspekt der Nachhaltigkeit". In: M. Held et H.G. Nutzinger (eds.) Eigentumsrechte verpflichten: Individuum, Gesellschaft und die Institution Eigentum. Campus, Frankfurt/New York, pp. 126-142. BUCHMANN W., 1997. – Schweizer Bürgergemeinden als Landschafts-Aktoren: ihr Grundeigentum und dessen aktuelle Entwicklung am Beispiel von Bern, Chur und Solothurn, Basler Feldbuch, Kommissionsverlag, Wepf. GERBER J.-D., 2006. – Structure de gestion des rivalités d’usage du paysage. Une analyse comparée de trois cas alpins. Écologie & Société, Rüegger, Zurich. GESER H., 2002. – "Die Gemeinden in der Schweiz". In: U. Klöti et al. Handbuch der Schweizer Politik. NZZ Verlag, Zürich, pp. 421-468. GODARD O., 1990. – "Environnement, modes de coordination et systèmes de légitimité: analyse de la catégorie de patrimoine naturel". Revue économique, n° 41(2), pp. 215-241. KNOEPFEL P., KISSLING-NÄF I., VARONE F., 2001. – "Institutionelle Ressourcen-Regime". In: P. Knoepfel, I. Kissling-Näf, F. Varone (eds.) Institutionelle Regime für natürliche Ressourcen: Boden, Wasser und Wald im Vergleich. Helbing & Lichtenhahn, Basel, pp. 11-48. MOOR P., 1992. – Droit administratif. Volume III : L’organisation des activités administratives, Les biens de l’État. Éditions Staempfli & Cie, Berne. OSTROM E., 2000. – "Reformulating the Commons". Swiss Political Science Review 6 (1), pp. 29-52. RODEWALD R., KNOEPFEL P., 2005. – Institutionelle Regime für nachhaltige Landschaftsentwicklung. Ökologie & Gesellschaft, Rüegger, Zürich. VIVIEN F.-D., 2001. – Le "patrimoine naturel" : jeux et enjeux entre nature et société (document de travail). Séminaire <Patrimoine>, UFR de sciences économiques et de gestion/ Urca, Reims. 1 The landscape may be considered as a common-pool resource in the sense that the exclusion of potential users is difficult and/or there is rivalry between its uses. Even if the aesthetic services provided by the landscape cannot be broken down into "subtractable" units, the excessive presence of visitors (over-frequentation) results in use rivalries. 3 It should be stressed, however, that the Federal provisions facilitating naturalizations have reduced the prerogatives of civic municipalities in this area. 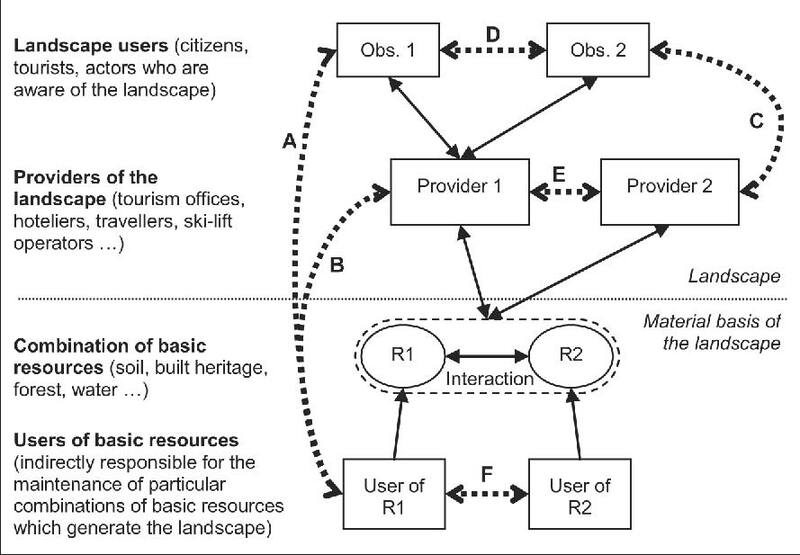 Jean-David Gerber, Raimund Rodewald et Peter Knoepfel, « The sustainable management of the landscape », Revue de Géographie Alpine | Journal of Alpine Research, 95-3 | 2007, 63-74.